The Easiest Stain to Apply that we offer! Extremely easy to apply. Even first time users can expect perfect results. Absolutely will not overlap, run or leave drip marks. Dives deep to replenish old dry wood. Loaded with transoxide pigments providing much better coverage than other paraffinic stains. Ideal for annual maintenance coats. 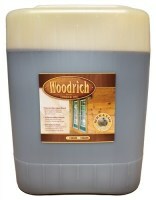 If you have ever worked with paraffinic based wood stains, Woodrich Brand Timber Oil will have a familiar ease of use. No matter what application method you choose, it is impossible to cause any lap marks or runs. Even Homeowners who have never worked with wood at all can achieve a beautiful finish their very first try with this easy to use product. For those who have used other paraffinic based products in the past, the most striking difference with Woodrich Brand Timber Oil is quality. Boasting extremely high pigment content Woodrich Brand Timber Oil will not color shift or "fade out" like other products. TheSealerStore Brand Timber Oil is also loaded down with enough antifungal agents to knock out any existing mold and mildew spores and help prevent new growth for several years even in the most challenging environments. Our anti-fungal package has been "jungle tested" and proven effective against over 250 known sources of mold and mildew. What this means to you is greater protection from less product. In fact you can expect to use about 20% less product to achieve the same results you get from other brands. This may not mean much on a 12'x12' deck, but it will add up to thousands of dollars over the year for a contractor. When you apply Woodrich Brand Timber Oil you will see the rich oils dive deep into the wood, replenishing it and occupying the voids that may otherwise trap moisture. Replenishing old dry wood will help to dramatically extend it's service life. Even old neglected wood siding will be rejuvenated by the deep conditioning oils.